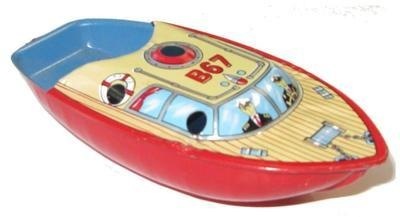 B 68 Pop Pop Boat. Unused condition, 4" / 10cm long. Unused condition, 4" - 10cm long. Detailed lithographed model. Minor scratched to the hull. Overall very clean condition. Original accessories are not with this boat. We will include a fuel pan, candles and a dropper in order to sail this model.